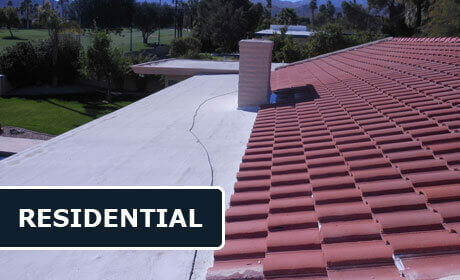 Since 1976, Corona Coatings Corp. has focused on meeting and exceeding the expectations of our Palm Springs commercial and residential clients by providing the highest quality polyurethane spray foam roofing, wall insulation, and storage tank insulation services available at competitive prices. By emphasizing excellent customer service, we have built a solid reputation throughout our service area, and over the years, our skilled technicians have performed thousands of commercial and residential spray foam installation projects for Inland empire homeowners, business owners, and building contractors. At Corona Coatings, we require all of our highly trained technicians to adhere to the highest standards of professionalism in both their workmanship as well as in their conduct while on our jobsites. Our skilled application technicians each have 12 to 14 years of experience working in the spray foam roofing and foam insulation industry, and are required to complete on-going training in the latest techniques of installing the high-performance spray foam insulation products we provide. Call us today for a free onsite estimate. Discover how the high quality polyurethane spray foam products we provide can improve your Palm Springs home or business environment, as well as your budget. Corona Coatings holds both a C-39 Roofing Contractor's license as well as a C-2 Insulation Contractor's license, and is a proud member of the Better Business Bureau (BBB) and the Spray Foam Insulation Alliance (SFIA). 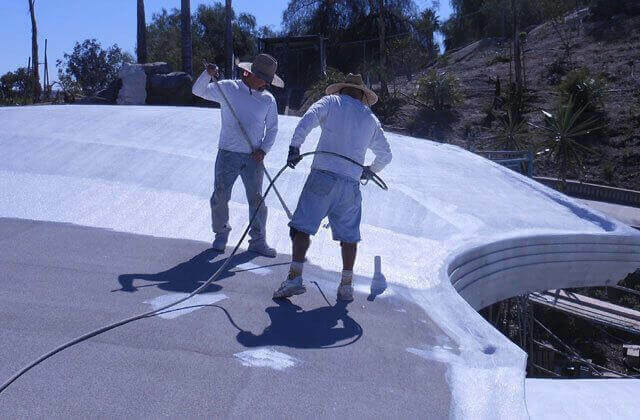 Corona Coatings Corp. is dedicated to providing high quality spray foam roofing, wall insulation, tank coating, and roof maintenance, inspection, and certification services for Palm Springs businesses and construction industry professionals at competitive prices. At Corona Coatings, we are an authorized contractor for both the Henry Company and NCFI Polyurethanes, and proudly install their spray polyurethane foam roofing and insulation products for our valued commercial clients. Is your commercial built-up, cap sheet, gravel, metal, or standing seam roof leaking, or is it weathered beyond repair? Don't install the same problematic asphalt-based roofing system again. Call Corona Coatings Corp. today. The decision to install spray foam roofing and wall insulation at your Palm Springs home can have a significant impact on your energy budget, greatly reducing utility bills, and at Corona Coatings Corp., we have installed our long-lasting, energy efficient spray polyurethane foam roofing, wall insulation, and tank coating for Palm Springs homeowners since 1976. Insulation is an extremely important aspect of every home's design, because it has a major impact on the comfort of those inside. Spray polyurethane foam roofing and wall insulation systems provide superior thermal performance over traditional insulation systems. They possess a higher R-value, and unlike conventional fiberglass and cellulose insulation, which is characterized by gaps in coverage, form a seamless envelope around a home for the most effective thermal barrier possible. In addition, foam roofing and wall insulation inhibits airflow through roofs and walls, preventing the influx of dust, pollen, and outside noise. 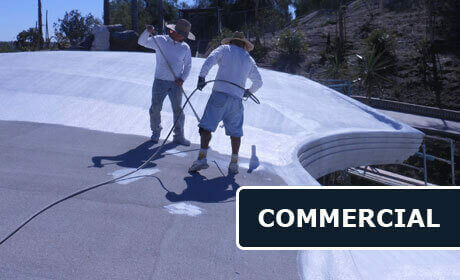 Why choose a spray polyurethane roofing system for your Palm Springs home or business? A spray polyurethane roofing system is a monolithic, seamless structure that has the capacity to adhere to horizontal, vertical, and overhead surfaces. It is self-flashing, fills and seals small open spaces, and fills low areas caused by roof sagging or construction faults. Spray polyurethane roofing systems (SPRS) are the ideal alternative to roofing or re-roofing your commercial or residential property with traditional asphalt-based roofing materials. Foam roofing systems are lightweight, and will do little to increase a roof's structural load, are flexible enough to withstand foot traffic, and are highly energy efficient when compared to conventional roofing systems. However, while polyurethane foam roofing systems are extremely durable, periodic maintenance is important to ensure that they function optimally during the course of their lifespans. At Corona Coatings Corp., we offer an affordable annual routine maintenance service in which we clean and inspect spray foam roofs, removing all debris and checking the roof membrane for any damage. 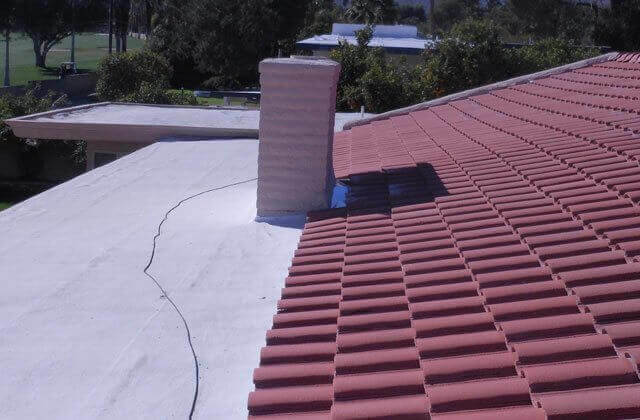 Upon the completion of our inspection, our foam roofing professionals will recommend necessary repairs, always keeping the long-term functionality of your Palm Springs home or business spray foam roofing system in mind. And saves our clients significantly on their energy costs. At Corona Coatings, we have provided our tank insulation services to homes, businesses and municipalities throughout the Inland Empire. In addition, because foam insulation adds inches to the diameter of storage tanks, our technicians always replace our clients' storage tank fittings as necessary following foam insulation application, in order to accommodate the increased dimensions of the tank. Call us today, for a free onsite estimate in Palm Springs. Corona Coatings Corp. also installs energy efficient spray foam wall insulation for Palm Springs homes and businesses as well as residential and commercial properties throughout the Inland Empire. The decision to install polyurethane foam wall insulation in your home or business is a wise investment in your building's value and functionality. Spray polyurethane foam's thermal properties are far superior to those of blown-in cellulose insulation or fiberglass batt insulation. In addition, unlike fiberglass batt and cellulose insulation, spray polyurethane foam wall insulation has the ability to conform tightly to every angle and structure within the wall cavity, eliminating gaps around electrical outlets and conduits, and forming a tight seal around pipes and other through-the-wall plumbing penetrations. When taken in combination, the insulating properties of foam wall insulation can result in significant energy savings for home and business owners. Call Us Today. Choose the industry leader, and discover how our superior polyurethane spray foam insulation products can enhance the comfort of your Palm Springs home or business and reduce your energy costs. Corona Coatings Corp. is licensed, bonded, and insured.